On Thursday I was honored to teach the final class of the year for the Ladies Bible Class at my church. During this fall semester, my dear friend Andrea has been leading the class in a study entitled "Praying to God in God's Own Words." She explored The Lord's Prayer and several other New Testament prayers. Early last summer she asked me if I would be willing to teach the concluding lesson on praying the Psalms. As it has every Thursday, the class began with the recitation of the Lord's Prayer followed by the old Sunday School standard "Whisper a prayer... to keep your heart in tune." 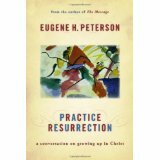 Eugene H. Peterson: Practice Resurrection. A Conversation on Growing Up in Christ. Grand Rapids, MI: William B. Eerdmans Publishing Company, 2010. "Why are people so ready to appoint a representative to do their praying for them? Why is there so much more talk about prayer than actual praying? Why are so many more doubts expressed and questions raised about this form of language than any other? Language objectifies both the world before us and the people around us…. " For this, for everything, we are out of tune..."
Wordsworth's use of the phrase "out of tune" as did the little song with which we began the class suggests that the reason one should "whisper a prayer" is to "keep your heart in tune." One of the illustrations I often use when teaching the Psalms is a pair of tuning forks, each tuned to the same note but an octave apart. When one fork is struck and begins to vibrate and the second is brought near to the first, the second will also begin to vibrate. They are "in tune" and they resonate together. So it is when one reads a Psalm and finds in the words an echo, a perfect expression, of one's own joy or pain. Indeed, in the world around us, in our everyday encounters, most of our language is used... “getting and spending.” Too often, we bring this use of language into our prayers. "But language at its core and its best reveals. Using words, I can speak myself into relationship with another." Prayer works in the same way. When we learn the language of prayer, it can speak us into a relationship with God. The practice of prayer, if it is going to amount to anything more than wish lists and complaints, requires a recovery of personal, relational, revelational language in both our listening and our speaking." We are blessed to have Caleb McDaniel teaching the Open Door Class and I greatly appreciate the historical perspective he brings to our class and to my study. Currently we are looking at the creeds of Christendom, beginning with some creeds or creed-like sections of the New Testament and then looking at other very early creeds, The Apostles' Creed, The Nicene Creed in its several revisions, and several others in coming weeks. Last Sunday, he noted that looking at changes from creed to creed gives us glimpses of what was happening in the culture of that time but that looking at those things which are “continuous and consistent” throughout the centuries can help us see what is really the core of Christian belief. When the church and its members begin to learn prayer as a second language what is "continuous and consistent" is the use of the Psalms. For example, lectionaries and the Daily Office include daily Psalms. Almost all published editions of the New Testament (such as those distributed by the Gideons) include the Psalms. Almost all books of daily devotions will reference the Psalms. Some Christians (not I!) may dismiss the stories and prophecies of the Old Testament as fulfilled and irrelevant to the practice of Christianity but, through the millennia, the "classic text book for recovering the personal language of prayer is the Psalms. A thorough immersion in the Psalms is the primary way that Christians acquire fluency in the personal, intimate, honest, earthy, language of prayer and take our place in the great company of our praying ancestors." Those praying ancestors are part of that “great cloud of witnesses" about which Caleb preached form the pulpit last Sunday and when we pray the same words of scripture which they prayed we are with them and they are with us. "For while prayer is always personal, it is never individual. At prayer we are part of a great congregation whether we see them or not. Praying the Psalms gets us used to being in a praying congregation… We are never less alone than when we pray, even when there is no one else in the room. We are praying for others who don’t know we are praying for them. Others are praying for us although we don’t know it…. When we pray we are not self-enclosed. Praying the Psalms keeps us in a school of prayer that maintains wakefulness and an open ear, alertness and an articulate tongue, both to the word of God and to the voices of praise and pain of God’s people." We see that in the New Testament prayers that Andrea has led us through this Fall. Today I want to recall the lesson she taught a couple of weeks ago on the Apostle Paul’s great prayer from his letter to the Ephesians. I make mention of you in my prayers: 17 that the God of our Lord Jesus Christ, the Father of glory, may give to you the spirit of wisdom and revelation in the knowledge of Him, 18 the eyes of your understanding[a] being enlightened; that you may know what is the hope of His calling, what are the riches of the glory of His inheritance in the saints, 19 and what is the exceeding greatness of His power toward us who believe, according to the working of His mighty power . Note that Paul’s prayer begins with God's great work of salvation, the riches of his glory, which leads to exultant act of worship. Peterson reminds us that "…prayers of intercession flow out of the plenitude of God. The plenitude of God, not the penury of the human condition…"
Too often in our prayers we bring the language of our need, of human poverty, into our prayers, failing to see the "riches of his glory" which are abundantly more that our need. The Psalms encourage lament, the full recognition of human need and pain but they also encourage thanksgiving and trust, the "steadfast love of the Lord" which never ceases. In chapter four of Ephesians Paul quotes the 68th Psalm. Peterson argues that the 68th Psalm offers "a structure that gives literary and theological shape to what he writes: first a thorough meditative immersion in the action and word of God (chapters 1-3), which then takes form in a worship-generated life of believing obedience (chapters 4-6)." "All that God is and does—riding the clouds, transforming the wilderness, commanding the prophetic proclamation of good news, taking charge once and for all by ascending the “high mount”—is brought together in a worshiping procession of singers and musicians into the sanctuary, bringing gifts, acclaiming blessings. Sanctuary is what we create for ourselves, as individuals and as a community, when we pray. Even from the rebellious, That the LORD God might dwell there." Note that Paul changes the quote from the triumphant King who receives gifts to the Messiah who gives gifts. It is not because Saul, the rabbinic student of the great Gamaliel, does not know the scripture. Paul, the Apostle, changes it because Jesus does indeed change everything. Such a simple fact which I never noticed until I began to prepare this lessons: Jesus, the Messiah, the anointed of God gives us gifts from "the riches of God's glory" and that changes, or perhaps it is better to say fulfills, the scripture in a way that is surprising. So here in the 68th Psalm, as in so many others, we find a model not only for the language of prayer but also for the day-to-day practice of Christian life. The class then moved from my talking about prayer to the practice of prayer. When one learns a second language, one must go to the language lab; one must begin to speak the language. Deep breath and exhale to prepare for prayer. The class then sang a few songs and read selections from the Psalm. We attempted to read it not as text to be studied but as prayer—personal, relational, communal prayer. We each read aloud but made no attempt to read in unison. We wanted to pray as individuals but to be aware of the "murmur" of the "cloud of witnesses" around us. I suggested that we pray the 68th Psalm as intercession for the persecuted church. To worship you… Oh, my soul, rejoice! Serendipity: Although we were reading/praying individually, the phrasing of the psalm seemed to move us increasingly toward unity. We found that we were reading in unison; we could in fact not read in unison. I had not anticipated this lesson on one of the functions of prayer. We pray to create unity. Praying the Psalms is not only the great school of prayer but a source of our unity with God, with our best selves, with one another, and with Christians in all places and in all times. The hymns were from Songs of Faith and Praise. The scripture readings were from NKJV.